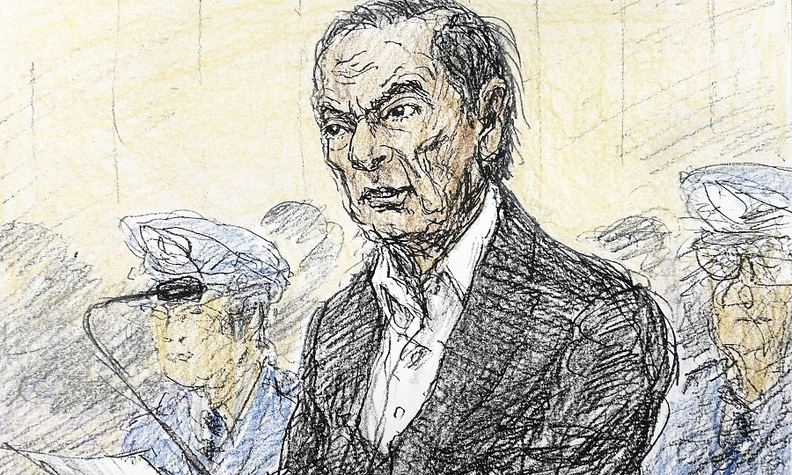 Ghosn, shown in a courtroom sketch, is being attended to by a doctor. He appeared in court looking thinner and with sunken cheeks. TOKYO -- After spending more than a month in a prison room in Tokyo, Carlos Ghosn has developed a fever, prompting the Japanese authorities to stop interrogating the former Nissan chairman. A doctor is attending to Ghosn who is tired from the long detention and interrogations, said his lawyer, Motonari Otsuru. Ghosn, 64, has been locked up in a small Tokyo jail cell with a toilet and wash basin since his arrest Nov. 19. Japanese prosecutors plan to indict Ghosn on two more charges of financial misconduct on Friday, a person with knowledge of the issue told Reuters, bringing the total number to three. Ghosn is likely to be formally charged with aggravated breach of trust for temporarily transferring personal investment losses to Nissan in 2008, as well as for understating his compensation for three years through 2018. The Nikkei daily newspaper reported, citing unidentified investigation sources, that Ghosn had discussed the possibility of extending a 3 billion-yen ($27.81 million) loan to a business run by a Saudi acquaintance who later provided collateral for a personal investment. The charges, which have been widely expected, will add to an earlier charge of under-reporting his income by around half over the five years through March 2015. On Wednesday, Ghosn lost an appeal against his ongoing detention, diminishing the prospects of an early release on bail. His current detention term is scheduled to end Friday. At a court appearance this week, Ghosn said all accusations against him were "meritless" and "unsubstantiated." It is uncommon for defendants in Japan who deny charges to be granted bail ahead of trial, a practice that has drawn widespread criticism, including from Ghosn's defense team. A member of Ghosn's Japan-based legal team told Reuters that Ghosn did not attend an interrogation session scheduled for Thursday due to a fever, and that he had been advised by a detention center physician to rest. Another member of the legal team told Reuters that they would apply for bail after Ghosn's current detention period ends on Friday, but that his release would come on Tuesday at the earliest should the court accept the application. Speaking with reporters on Tuesday, Motonari Otsuru, who leads Ghosn's legal team, said he expected prosecutors to take at least six months to prepare for trial. Nissan could also face an indictment over the latest compensation reporting issue, a source said. Ghosn’s former aide and Nissan director Greg Kelly -- arrested the same day as Ghosn -- was released from jail last month and taken to a hospital afterward, Kyodo News reported earlier.